This is our most popular model, the Bimini Ring Game Ringmaster portable which sets up anywhere. This is all you need for your family and friends to have hours of fun. Once set up you cannot walk by without swinging a few rings. And, just watch all the happy faces when they get a ringer. Included inside is a brief history of the game, how to play and instructions for setup. You will quickly develop and perfect your skills every time you play. In just a short time you will surprise yourself at how accurate you become with the ring. Soon, all of your friends will be calling you, the RINGMASTER!! 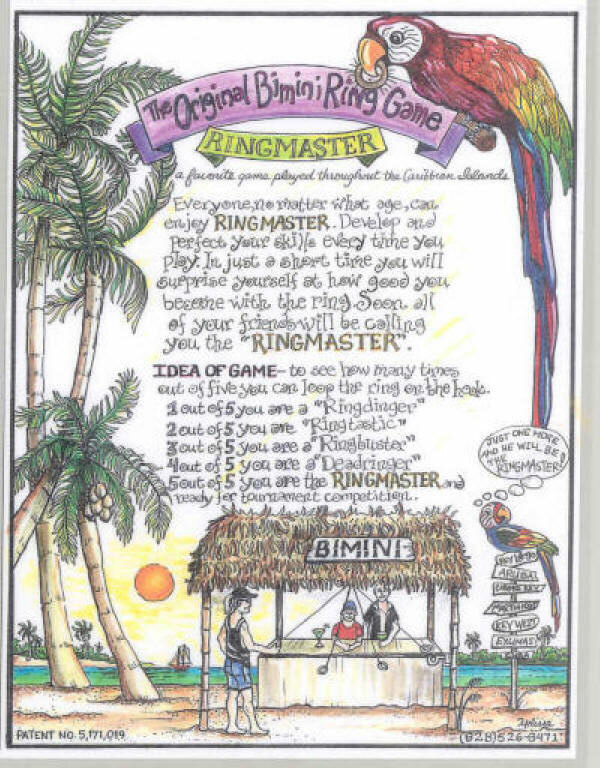 OUR PHILOSOPHY: In a world swelling with automated toys and elaborate computer games, come celebrate SIMPLICITY with Bimini Ring Game...No Batteries required! The Ring Game easily sets up in your home, on your deck, or even in the office break room. The list is endless and so are the years of good old fashion fun you will enjoy with your game. For any of the quantities below please provide your mailing address. Buy 3 - 12 games and pay only $5.00 for each one! Call us toll free for overnight at 866-379-2766. Ringmaster is a great idea for gifts, stocking stuffers and giveaways. Here's the big break: Get a friend or two and split an order of 36 games. This means you only have $39.00 each invested in 12 gifts each. Ringmaster is the perfect gift for anyone! NOW, FOR AN ABSOLUTE MUST!!! Please don't forget one of our beautiful laminated cards with a brief history and how to play the game. It really adds that finishing touch and dresses up your game. You will love it! Just make sure you get at least 1 for yourself. Put it up beside your game or pass it around to your friends while playing. They will be laughing before you know it. Card size: 5 1/2" by 7" - in full bright Caribbean colors. Guaranteed fun for that Caribbean party night! The Party Kit includes 3 ring games and 3 of our beautiful laminated cards. One for the party and 2 for giveaways or prizes to the winners. Guaranteed to be a wild fun night! Want to hear more? See our Custom Tournament Models. Every game we make is all about, smiles, laughs and good times! Copyright © 1992 - 2008 by Bimini Enterprises, Inc. All Rights Reserved.